Kissing the Joy as it Flies: Something is haaaaaaappening! No time to talk, but big things are happening over here in organizing land. 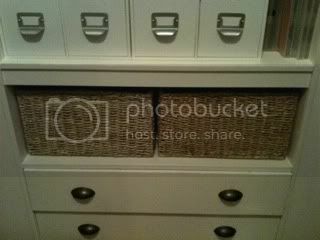 I don't want to spoil the surprise, but it involves baskets and scrapbook storage cubes with cubbies. I just texted my friend Jennifer, who is stalking the 21-day challenge and silently participating along with me, to tell her that I was on a high. It's like having gold fever. Is organization a drug? I bought a label maker. Does that make me a junkie? I can't wait till I have decent light tomorrow so I can take some pictures. I think it's time to unveil the "big stupid thing" that I bought at Goodwill which is now, perhaps, worthy of being called an "After." It makes me happy.